"I chose the name Nurturing Fibres for my Indie dyeing label because I nurture colour into the yarn and then you, the knitter, crocheter, weaver then nurture the yarn into a garment. Finally the garment nurtures and comforts." She focuses on merino wool, cotton, and mohair in different weights. 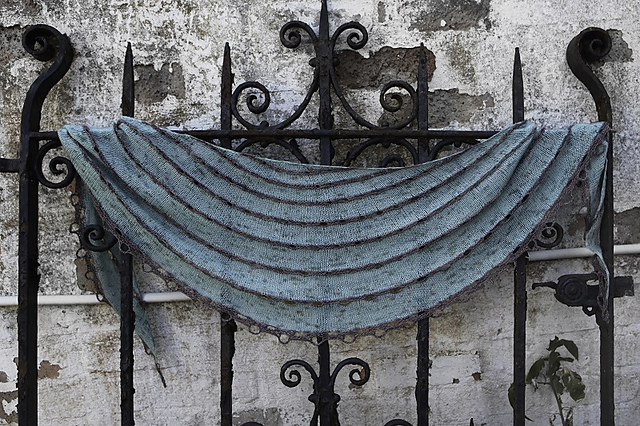 The colorways used in the prototype shawl pattern are Venice and Satchel. If you don't see the colorway in stock, you can message Carle' and she will help you. A 3.5mm or US 4 needle is used and 547 yards (500m) of yarn is needed. I just love the yarnover edging, so elegant and perfect for summer evenings after the sun goes down. Abalone is knit flat and crescent-shaped. Thank you Carle'. 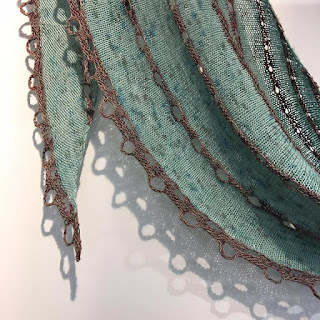 You can find the Abalone shawl pattern here. The designer is located in South Africa and she can be reached via email.